The Barack Obama news conference by the "bin Laden slayer" began shortly after 11 PM on May 2, 3012. Two hours before the official announcment, Keith Urbahn, the Chief of Staff for former Defense Secretary Donald Rumsfeld announced at around 9 p.m. that he had been told by a reputatable person that the Navy Seals killed bin Laden at his compound in Abbittabad, Pakistan. As he campaigned to actually win his first presidential election (in order to keep what he failed to win constitutionally in 2008), Obama campaign ads claimed Obama was a "military hero" for killing Osama bin Laden (although Obama did nothing). A Navy Seal team invaded Bin Laden's compound and ended the life of the terrorist. The Obama campaign ad implied that Mitt Romney would not have been as brave as Obama in issuing the kill order. 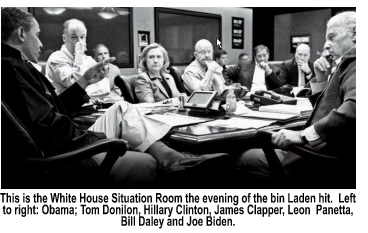 However, If you watched the Situation Room video when the Seals were asking permission to take out bin Laden, Obama was too wimpish to give it. Then CIA Director Leon Panetta gave the kill order. In the afermath of the Sept. 11, 2012 attack by Muslim extremists at the US consulate compound in Benghazi which resulted in the deaths of US Ambassador Christopher Stevens, Consulate IT Specialist Sean Smith, and two former US Navy Seals: Glenn Doherty and Tyrone Woods, who killed 60 al Qaeda terrorists in the attack on the consulate before they were finally overwhelmed and killed. Those two men deserve to be retroactively although posthumously reinducted into the Seals and both men need to be awarded the Congressional Medal of Honor. They were the only heroes in the Benghazi terrorist attacknot Obama, who stood before the world on multinetwork TV with a puffed-up chest claiming that he killed Obama. Any American with a brain the size of a shrimp who watched the closet-Muslim Obama cower from giving the bin Laden kill order (perhaps out of fear that some Muslim cleric would place a fatwah on him) also watched then CIA Director Leon Panetta give the Seals the okay to take out bin Laden. 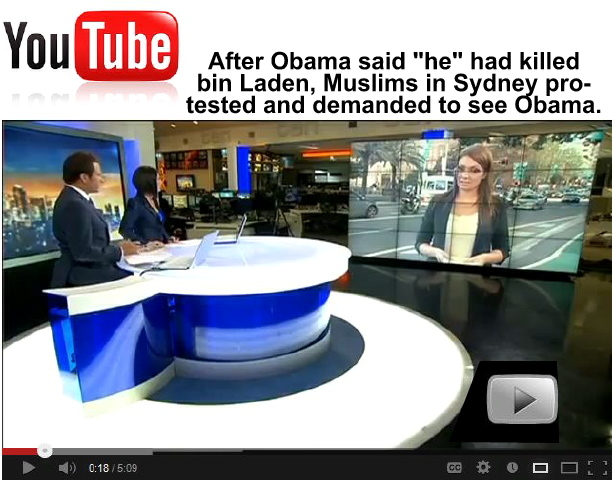 But the Muslims in Sydney, Australian apparently didn't watch that scenario play out on US TV. But, they did see the Arab media replays of Obama's confression that he killed Osama bin Laden. Bet he wishes he could slip that one back to Panetta without anyone in the United States learning he recanted his confession as the giant slayer. On Sept. 12one day after the Benghazi attack by an al Qaeda-linked terrorist group, Barack Obama told 60 Minutes that Benghazi was a terrorist attack. Two days later, on the 14th, he changed his tune, claiming that al Qaeda was in disarray and "on the run." Using Cairo as a parallel event to Benghazi, he then claimed that a cartoon video produced by an Egyptian Coptic Christian in the United States triggered a whole host of protests on US and allied embassies around the world. 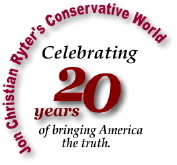 On Sept. 15, 2012, the Muslims in Sydney, Australia decided to show the Americans that Obama lied to themand that al Qaeda and the Muslim extremists around the world were just as aggressive and "jihad" was just as much a threat to America and its allies as it was on May 1. As the peaceful Muslim protests in Sydney became increasingly violent over the next five days, no one in the United States even knew there was an anti-Barack Obama protest taking place for five days. Again, not reported in the US media, a concrete wall was hastily built by the Egytian government to keep al Qaeda-linked extremists from overrunnng the US Embassy in Cairo as it overran the US Consulate in Libya. In Afghanistan, the Taliban burned Obama in effigy. In the Sudan, the German mission was burned. While the US media reported on the Sudanese mission being burned and breaching the wall of the US Embassy in Cairo, and raising the al Qaeda flag over these missions, Susan Rice, on September 16 through the 18th as the iriots continued in Sydney, Australia continued to escalate, UN Ambassador Susan Ricewhose deception Obama intends to reward by naming Rice his new National Intelligence Adviserwas making the rounds of the leftwing media television Sunday talk shows, insisting that was was happening were spontaneous protests resulting from the Egyptian Coptic's Internet cartoon belittling Mohammad when no one in the Muslim world had ever seen it before the US State Department used it as the reason for the violent protests throughout the Mideast which all appear to have been directed at Barack Obama who wasat the momentcampaigning as the modern day David who slayed Goliath. And then spent seven and a half months lying about Benghazi.